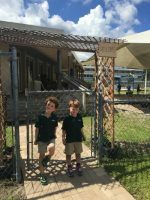 Shorecrest Preparatory School in St. Petersburg, Florida serves a diverse community of nearly 1,000 students age 3-years-old through 12th grade. Every day Shorecrest faculty, staff and students live the school’s mission, educating students to become lifelong learners in the pursuit of personal and academic excellence, physical well-being, creative achievement and the development of a commitment to social responsibility. 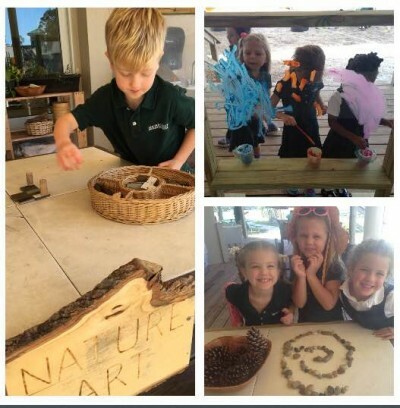 That mission is fulfilled in part, in outdoor learning spaces. History, philosophy, and geography play equally into the school’s commitment to outdoor learning environments, dating back to its founding in 1923 as the Shorecrest Outdoor School. In the School’s early years, children of mostly seasonal residents enjoyed classes almost entirely out-of-doors in the balmy weather of St. Petersburg, known by locals as ‘the Sunshine City,’ on Florida’s Gulf Coast. 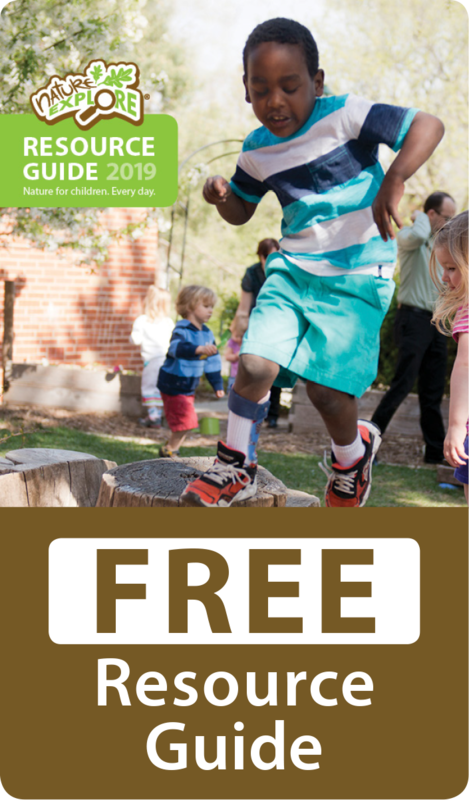 While there are dozens of outdoor eating, playing, and learning areas on the School’s 28-acre campus, perhaps the most transformational outdoor space is the Experiential School Outdoor Classroom. 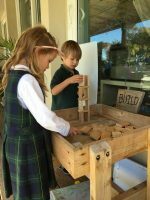 The Experiential School serves Shorecrest’s youngest students, just 3, 4, and 5-years-old, where they explore, experience, and engage, developing a strong foundation and love for learning. At the main entrance of the Outdoor Classroom, a cheerful trellis climbing with flowering vines welcomes visitors. To the left sit three rows of carefully tended garden planters, seasonally overflowing with leafy greens. 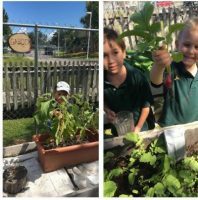 The vegetables are planted, tended, and harvested by the preschool children who regularly enjoy the harvest in recipes for snacks. To the right is a spacious sandbox often filled with children hard at work. 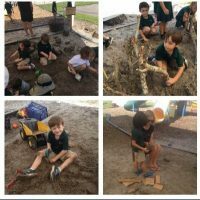 On a sunny spring morning, a pair of preschoolers meticulously stack “tree cookies” as they construct a house; another works solo filling a bucket with sand, then leveling the sand at the mouth of the bucket with a stick. Looking south from the shaded dig area, a group of students crowd around a teacher as she points out a ladybug on a flowering plant. The plant is one of many colorful blooms in a sunny spot in the middle of a narrow sidewalk. Around the sidewalk, three children giggle as they ride around their classmates, one on a tricycle, the others on scooters. They scoot past a music wall, mounted on a campus fence and labeled with a wooden sign where shiny pots, pans, boards and rattles await someone to come play them and fill the air with music. 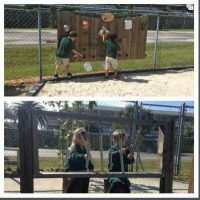 The Outdoor Classroom makes for marvelous choice-based free play during recess, but is also a powerful learning environment during more structured times of the school day. 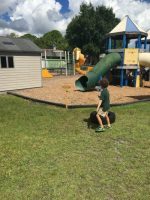 For example, after a study of the abstract expressionist art of Jackson Pollock, the children moved to the Outdoor Classroom to create their own works in his style. Similarly, another art exploration led them to the work of Claude Monet and other impressionists, after which the Experiential Schoolers painted “en plein air” themselves. It’s in the Outdoor Classroom that the students welcome a number of guest experts from the community, engage in field research for project work, and so much more. 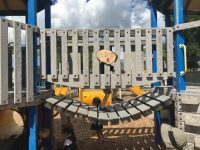 The space is used daily and has become a point of pride during tours with prospective parents, eager to ensure their children are engaged in deep learning but also have adequate time enjoying nature. While much has changed since the school’s humble beginnings as the Shorecrest Outdoor School, the philosophy and importance of a natural learning environment has remained steadfast.